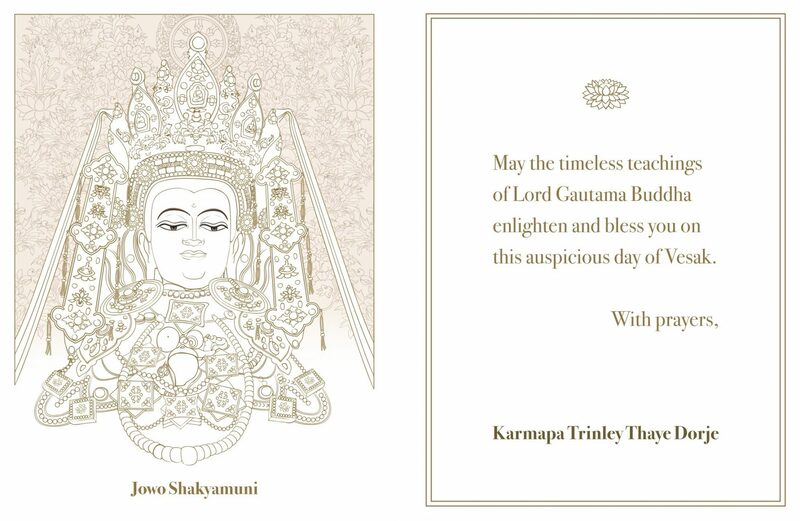 Today marks the eve of Vesak, the anniversary of the birth, enlightenment and parinirvana of Buddha Shakyamuni. Just think: some 2,500 years ago, on this very day, Prince Siddhartha was sitting in deep meditation under the Bodhi Tree in Bodh Gaya, spending his last moments as an ordinary being. As the moon approached its fullest state, so Prince Siddhartha’s compassion and wisdom were growing to their fullest Buddha-nature. Vesak is an opportunity to reflect not only on the life of Buddha, but on the journey that all of us are on, the path of a Bodhisattva, and the practical steps that it takes to become enlightened. For we do not need to take a leap of faith. Prince Siddhartha did not become a Buddha through some kind of magic or mystery. He became a Buddha through dedicated practice, through being an example of great courage, and this is what I encourage all of us to consider on this auspicious day. All of us have a Buddha nature, all of us have an Inner Wealth with limitless treasures of wisdom and compassion. The path that Buddha set before us is the path that lies within us. To realise our Buddha nature, we must to dedicate our lives to practice. The practice of mindfulness and awareness is something that we can all apply anywhere. The practice of loving kindness and compassion is something that we can all apply at any time. The practice of being a good human being is something that we can all apply right here, right now. We too are capable of extraordinary love, unconditional love. We too are capable of extraordinary compassion, limitless compassion. We too are capable of being an example, to inspire countless beings. Therefore, let us dedicate our lives to practice, and take daily steps on the journey of a Bodhisattva.